A drill that operates out of both sides at one. Lines are on all four blue lines. X1 starts of skating backwards, exchanging a puck with X2 – goal is anywhere from 2 to 4 passes. 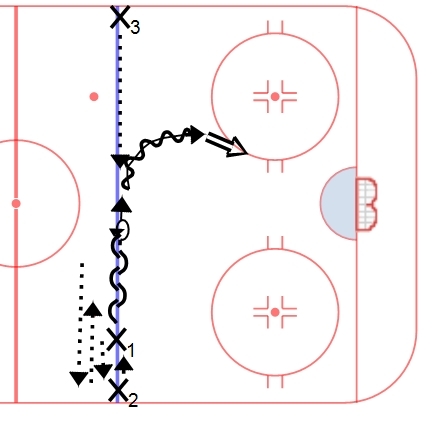 When X1 gets to the middle of the blue line, he pivots halfway around and receives a pass from X3. After receiving the pass, X1 accelerates into the zone for a shot on net. X3 should attempt to time his pass to arrive as X1 is finishing his turn. High pace and high tempo to this drill. Skaters should focus on quick feet and smooth transitions. Passes should be crisp and on the tape. Shots should be on net from a distance – a warmup element for the goalies.